Submitted by Norm Roulet on Mon, 09/21/2009 - 15:00. 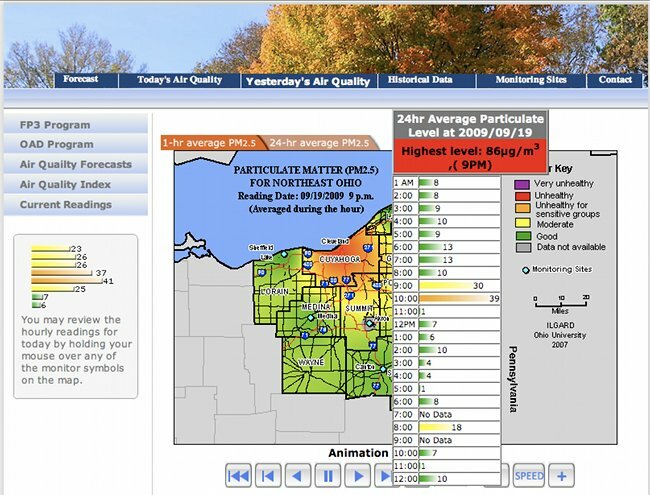 September 19, 2009, at around 9 PM, I had to take I-490 over the Flats, past the Mittal Cleveland Works plant, and the pollution was so thick I had to roll up the windows and turn on the air conditioner... and still I was sickened, coughing and wheezing severely. Not how you expect to feel going "downtown" on a Saturday night. 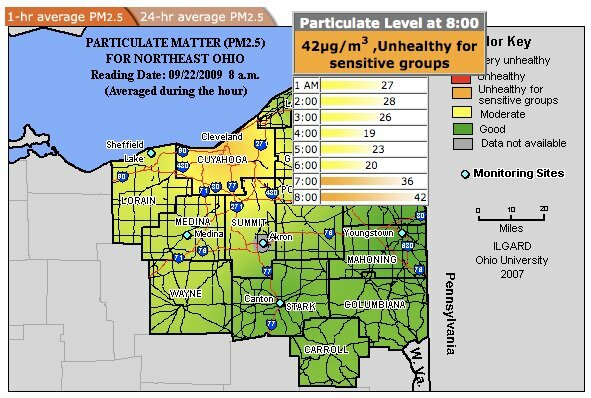 The next morning, I checked the particulate matter readings from Saturday night and was not shocked to see Cleveland Particulate Matter 2.5 readings at the "Unhealthy" level - 86 micrograms per cubic meter, at 9 PM that night... see above screenshot, from NOACA. If you pay attention to your body, you can tell when you are exposed to severe pollution, like this. Since moving to East Cleveland, I have felt much more exposed to and harmed by pollution than anywhere I've lived before. Coughing, wheezing, shortness of breath, chest pains, headaches, constant cold-like symptoms. I suspect this is due to several factors, including wind direction to major urban pollution sources and our proximity at the bottom of an 800' elevation, to the south, which may funnel pollution to our neighborhood... but, I have never seen any studies of pollution in this region to analyze any real pollution risk, by neighborhood or topographic location. Having a grandfather who died of a heart attack at 45, another who had a stroke in his 40s, and a father with a heart conditon, and learning from "Inhaling a heart attack: How air pollution can cause heart disease" that "researchers at the University of Michigan Health System have determined the very air we breathe can be an invisible catalyst to heart disease", I'm realizing the decison to live in urban Cleveland may well cost me my life. Since Mittal reopened, I have found urban Cleveland and especially the area around the Flats unbreathable. Mittal is an astoundingly dirty steel plant, and one of many major polluters in the Cuyahoga River Valley. I do not understand why we spend public dollars in support of building new housing and outdoor recreation facilities near major pollution sources like Mittal, as being there is unhealthy for citizens. We should encourage as few people to live, work and play around there as possible. As Cleveland is one of the most polluted and polluting places in America, and a global medical center, it is surprising we are not a world center of environmental health research, but we are not. I cannot find any local academic studies of the impact of our pollution on our residents, and economy - it seems this is a subject matter that is completely neglected here, by academics, researchers and government. Rather, our leadership and planners here seem to deny the harm from pollution on public health, encouraging redevelopment and residential growth in Cleveland urban areas which appear to be highly polluted by industry, like around the Flats, Tremont and University Circle. My family lives in "Greater" University Circle - the heart of our "Medical Industry" - in East Cleveland. When my family moved to East Cleveland, we didn't realize there are coal and natural gas fired boilers less than two kilometers from our home, at a private power plant at University Hospitals, operated by Medical Center Company (MMCo). Because of the lack of study of pollution here, we don't know how polluted and dangerous our neighborhood may be, but it feels very polluted. We do know MMCo burns tons of coal about a mile away. MMCO projects they will save their few institutional customers within University Circle $160 million, over the next ten years. What is the cost of the pollution to the public health and economic well being of the millions of people harmed by MCCo's pollution? Throughout Northeast Ohio, citizens are polluted by many other private industrial polluters, without benefit to citizens. In one of the most polluted regions in America, we do astoundingly little to measure, analyze and understand our pollution and its impact on the community. I believe this is intentional. Considering the poor health of our citizens, the poor performance of children in our urban schools, and the failure of our urban economy, I believe it is time to change our strategy about our environment entirely. The free abstract of an article titled "A review of intraurban variations in particulate air pollution: Implications for epidemiological research" concludes it is advisable to monitor pollution from multiple sites in an urban area. Epidemiological studies typically utilise one or few central monitoring stations as a proxy for personal exposure to particulate matter air pollution. 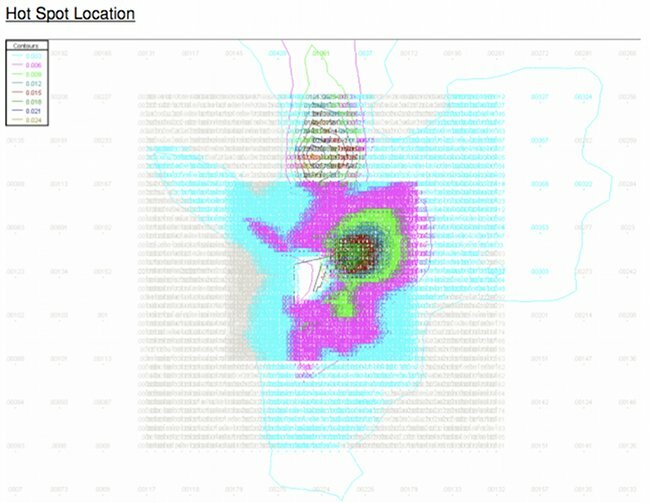 However, recent research indicates that central monitoring sites may not accurately characterize the spatial complexities of the particulate field across an urban area. Consequently, intraurban assessment of exposure to air pollution has become a priority area of study. This paper reviews particulate air pollution exposure studies with a focus on monitored-data studies at the intraurban spatial scale.... We find that particular attention should be given to local conditions and methods when using one or few monitoring sites to characterise wider population exposures. The utilisation of absolute and relative measures of homogeneity such as the coefficient of divergence which are based on data from several monitoring sites (e.g., n>4) in combination with an appropriate sample size (e.g., n 50) may reduce the possibility of misclassification based on incorrect assumptions about heterogeneity. The errors in exposure misclassification based on these assumptions about intraurban concentration variations are especially critical in long-term cohort epidemiological analyses that assess the effects of exposure variations in air pollution upon health. It does not appear there is significant, systematic monitoring of pollution near the MMCo plant, now. But EPA modelling of lead contamination at other pollution sources in the region, like the illustration below for Ellwood Engineering Castings, in Hubbard, Ohio, gives some signs of the type of lead fallout that may have occurred around the MMCo plant, over the decades... and may continue today... putting heavy metals and other pollutants in area soil and residents. The inner square below represents a 16 square kilometer monitoring area, with monitors every 50 meters. There are hotspots. There is sufficient reason to make environmental monitoring and testing in urban communities one of our highest public health priorities.Yet it seems the opposite has occured. Cleveland is one of the most polluted and polluting places in the United States, and every pollution source here should be investigated and eliminated, if possible... regulated and controlled, if not. For the 2000s, Global, US and local leadership has instead championed the concept of "sustainability" - maintain your evil - and the media has barely mentioned "pollution" since. "Pollution" has not been a recurring theme in the news, even as the media slowly acknowledges resulting climate change. Green jobs and sustainability have become the core of a new "greenwashing movement", and that is washing over significant pollution-related public health crises and resulting social and economic disasters. It is time we start talking about pollution again, with a new focus on public health, economic challenges and social change in polluted communities like Cleveland, which harm people worldwide. As the leadership of Northeast Ohio is not inclined to talk about our pollution, nor to reduce it, I ask the citizens of the world and NEO to lead this discussion, and force our leadership to follow. Submitted by noner on Mon, 09/21/2009 - 15:15.
our family has just chosen a five year plan and it does not include Cleveland. This is one of the important reasons why. Submitted by Norm Roulet on Mon, 09/21/2009 - 15:18.
our family is feeling the same way - less than 2 years if we can swing it... already have a friend lined up to take over our house, no matter how bad the pollution (it is a great house). Submitted by None on Mon, 09/21/2009 - 18:21. Submitted by Norm Roulet on Mon, 09/21/2009 - 21:13. About an hour after I posted this, the Mittal et al industrial machine responded on Cleveland.com with an article explaining "ArcelorMittal stoked up a furnace at its Cleveland steel mill Friday and resumed production over the weekend, bringing about 150 workers back from layoffs that the company ordered earlier this year." Yeah, that pollution is worth 150 jobs. Worth 850 jobs. Worth 1,000 of jobs. Worth a dead region? The results of firing up the first furnace after months of idleness should be apparent to Cleveland residents in the area and to motorists commuting into the city from the south: Plumes of smoke have begun to appear from stacks rising from the plant. A slew of cleveland.com members chime in to celebrate our pollution... a few show greater intelligence. This article is the greatest proof of my point of this posting ever imaginable. Cleveland Plain Dealer, you are shameful. yeehaw! they're homes (with their children) don't overlook it. Submitted by noner on Mon, 09/21/2009 - 21:55. Submitted by Norm Roulet on Mon, 09/21/2009 - 22:47. I was talking to a young friend who grew up in East Cleveland and got the hell out (recent Harvard environmental justice Master) about pollution and sprawl here, and joked I must have missed the memo telling everyone to get the hell out of Cleveland and move to the burbs, because the inner city is too polluting. My parents' home, in Shaker Heights, was part of the next great wave of pollution-flight that started in the 1910s, as soon as the automobile was reliable enough to get people away from pollution in the city, and 800 feet up into the heights. By the 1920s, people in the know knew the heights were not far enough... and the rich sprawled ever further, followed by anyone who may afford to live richly. The poor died miserable, polluted deaths in the city. I have people researching that memo... I expect we'll see the original was sent to a bunch of rich white people around 1900, and kept private among a small club of close friends and family who moved further and further out, and to Florida and Arizona since. I believe the original copy is in a vault at The County Club, althought it may be at the Hunt, Pepper Pike, Kirtland, Oakwood, Racquet or other sprawl private clubs far from around town. And. all those people made lots of money keeping the content of that memo private, all these years, so don't expect them to give it up without a fight. Submitted by Norm Roulet on Tue, 09/22/2009 - 10:33. As I went out to drive my son to pre-school, I was out of breath within a few minutes. As I type this my chest feels tight, I'm caughing, my throat hurts, and my sinuses are constantly running. It is a result of the pollution captured above, at 8 AM this monring in Cleveland. Get the hell out of town, NOW!!!!! Submitted by Norm Roulet on Tue, 09/22/2009 - 17:43. Industry definitiely pollutes in ways that harm the poor and minority populations most, and that is intentional.